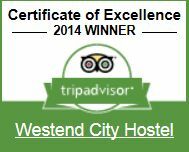 We warmly welcome you to Westend City Hostel with our international team!! Our hostel is ideally suited for group tours, school trips, graduation trips and city breaks. Our WESTEND CITY HOSTEL is the most centrally located international youth hostel right in the center of Vienna for reasonable prices. Our prime location in the old town of Vienna, close to the Westbahnhof (western railway station) and Innere Mariahilfer Straße (pedestrian street and the largest shopping boulevard in town) enables you to get to most historical sights, Museums, restaurants, theaters on foot or by public transportation in no time! To Museumsquartier (Museum of Fine Arts, Natural History Museum) 15 minutes walking distance. To Technical Museum in 5 minutes by tram Nr. 52 or 58, To Stephansplatz in 5 minutes with the Metro U3 or 30 minutes walking distance through a nice shopping boulevard; to the Schoenbrunn castle (Zoo) 10 minutes by tram Nr. 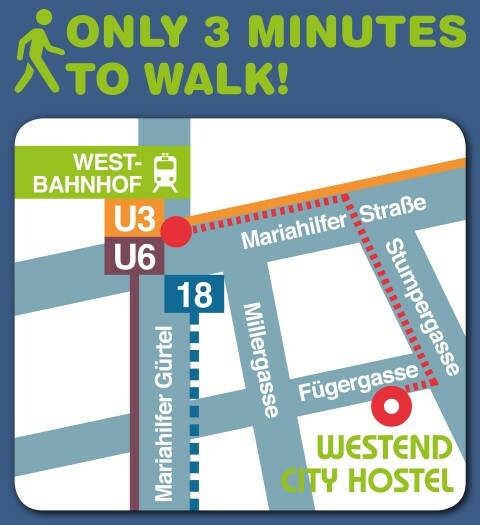 58; to Prater 15 minutes with Metro U3 and U1; to Vienna Central train station (Belvedere castle) 13 minutes by tram Nr. 18. WE HAVE NO CURFEW AND THE RECEPTION IS OPEN 24 HOURS! All rooms are equipped with bunk beds, lockers, shower and WC. On the Big Bus sightseeing tour of Vienna you will learn about the fascinating history of the city through informative and entertaining commentary. 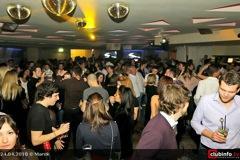 Our reasonable prices are per person and night incl. continental breakfast and bed linen. For a stay of only 1 night we charge a EUR 2,- fee for the cleaning of the bed linen for all dormitory beds. You can buy towels for 4,00 EUR and padlocks for 3,00,- EUR or you bring them yourself. If desired we also offer half-board (not served in the hostel). We can also offer take-away lunch boxes. Part or full cancellation must be in written form and may arrive us AT LEAST 3 months before arrival. If the deadline was not kept the cancellation fee is to be paid per person for all ordered services as listed: at least 3 months before arrival: Free of charge, 40% by 3-1 month, 70% by 1 month- 1 week, 90% within the last week, 100% of the total price on the date of arrival. Please notice: for Eastern, Whitsuntide, and Sylvester we can only accept reservations with at least 3 overnight accommodations! Westend City Hostel is entitled to take up to 200, – EUR, or 10% of the invoice amount, as a deposit on arrival, which will be returned after final inspection of the rooms for cleanliness. The Austrian hotel terms and conditions (AGBH) of the 15.11.2006 are valid as far as nothing else agreed.